Thinking about “sprucing” (pun intended) up the office? 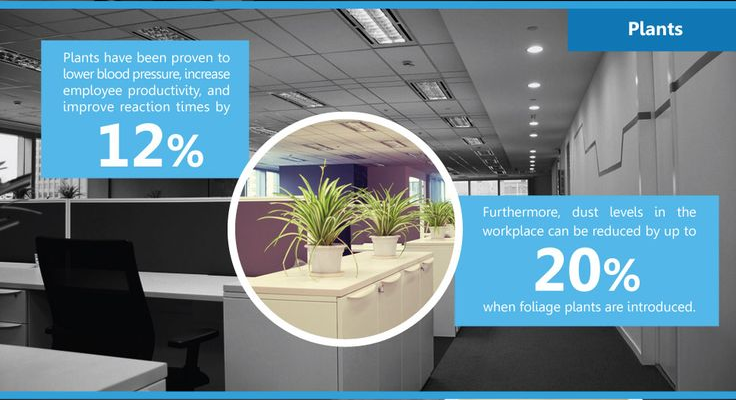 Recent studies have shown that if you have plants around the office – you are benefitting in more ways that one. Every office needs something colorful: whether it be different colored walls, unique carpeting, modern-looking desks, or fun desk trinkets – these things break up the sometimes monotonous workplace environment. An often overlooked and underutilized office accessory, however, are plants – which may be the most beneficial of all. The Classroom: According to the Royal College of Agriculture, plants may increase learning potential for students. In Hospitals: Compared to hospital rooms with little-to-no plants, patients with plants in their rooms experience less pain, anxiety and fatigue, take less pain medication, have lower blood pressure and heart rates, and are more pleased with their recovery rooms. In the Home: Rooms with plants contain 50-60 per cent fewer airborne molds and bacteria than rooms with no plants. Plants filter and clean the air, reducing chemicals linked to colds, breathing problems and even cancer, according to the Stennis Space Centre. Our Overall Health: According to NASA, houseplants can remove up to 87 per cent of air toxins within 24 hours, and can lead to reduced fatigue, coughs, sore throats and other cold-related illnesses by more than 30 per cent. How Else Do Plants Help? If you haven’t rushed out to the nearest greenhouse to buy yourself a desk plant yet, there are plenty more research studies that show how else being around plants can benefit you throughout your daily life. Increased Concentration and Memory: Tasks – located near or around nature – are performed better and with greater accuracy, ultimately generating a better result. Adding to that, being within or near nature can improve memory performance and attention span by 20 per cent. Increased Smiles: Office flowers and plants increase a persons mood and reduces the likelihood stress-related depression. Improved Relationships: Research shows that those who spend extended periods of time around plants tend to have better relationships with others. The exposure to nature and wildlife increases people’s compassion for each other and for the environment in which they live. Read about these – and more – benefits at the Texas A&M University website. Do you keep a large crop of plants in your office? If so – why? If not – why? Based on these research findings, are you headed to your nearest florist over your lunch break? Environmentally friendly products are now more important than ever, so we thought it’d be a good idea to let you know about some of the more environmentally friendly products that Innovative Office Solutions carries. 5. It’s no secret we at Innovative Office Solutions are HUGE Post-it product fans, and this first product is no exception. 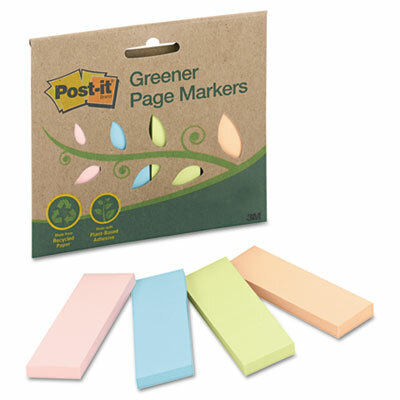 Post-It Greener Page Markers are a more environmental friendly take on the traditional page markers, as the adhesive is plant-based and the page markers themselves are made from recycled paper. Feel better when you eventually discard each marker that you may end up using that same marker years down the road. 4. 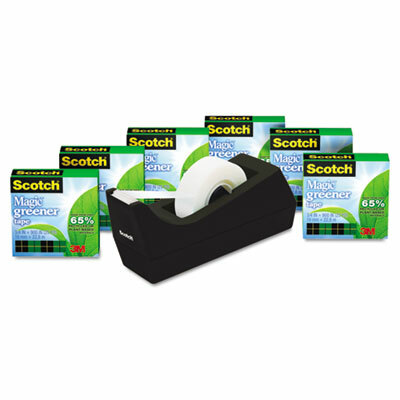 Scotch Brand Greener Tape is a more environmentally friendly alternative – yet still as versatile as the original. Made from 65% recycled or plant-based materials by weight, the alternative version is just as timeless and strong as the original. Aren’t you glad it’s not January? 3. 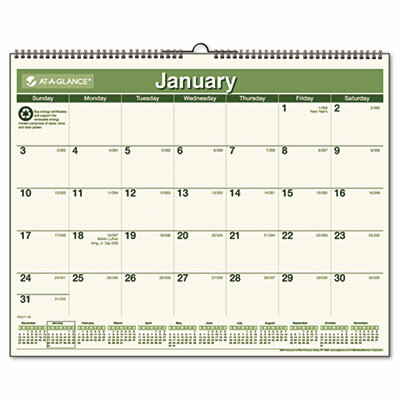 The AT-A-GLANCE Recycled Wall Calendar will soon become your new favorite office mate. Besides the fact it is a wall calendar that helps you keep track of your daily happenings, it also features monthly green living tips. Tips such as – “That picnic you’re planning for next weekend? Bring your own plates and silverware instead of plasticware.”. It always helps to be reminded of how you can live more environmentally friendly every day of the year. 2. Every office needs cups – and what better kind to have on hand than those that are completely compostable? 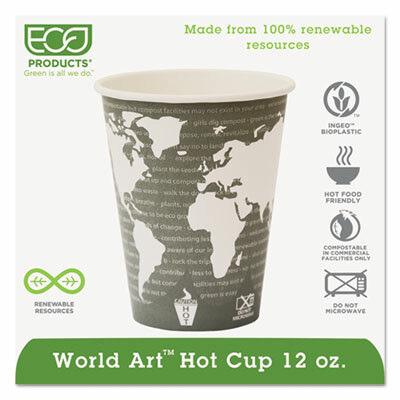 Made from 100% renewable resources, the Eco-Products World Art cup is perfect for your morning coffee. The cups are engineered with a leak-proof PLA liner – which is a corn-based polymer – ensures you don’t walk into a meeting with a stain, courtesy of your aforementioned morning joe. 1. As we mentioned in a previous post on keeping the office neat and tidy over the winter months, EcoGuard wiper matts come in first on our list of most essential environmentally friendly office products. 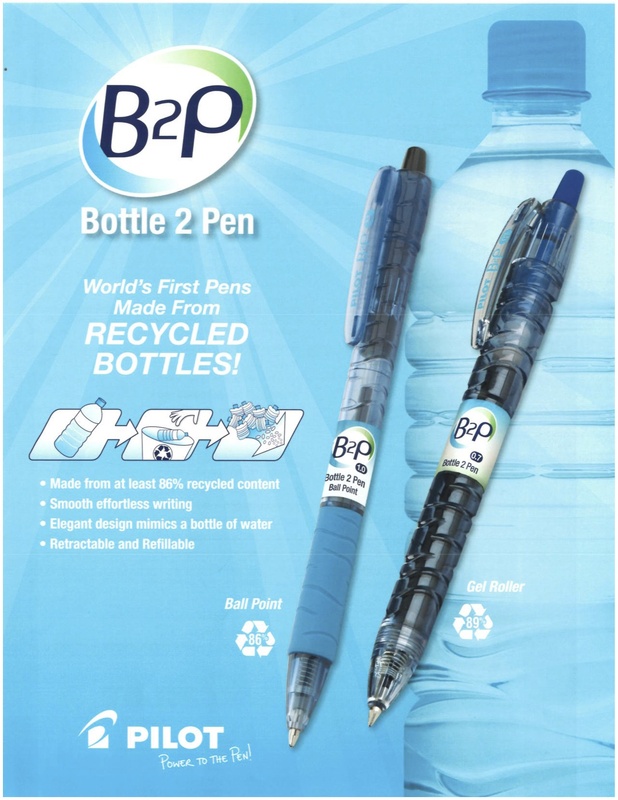 The carpeted surface is made from post-consumer recycled plastic bottles – so a few of these in the office give you the peace of mind knowing you’re helping keep plastic bottles out of our landfills. 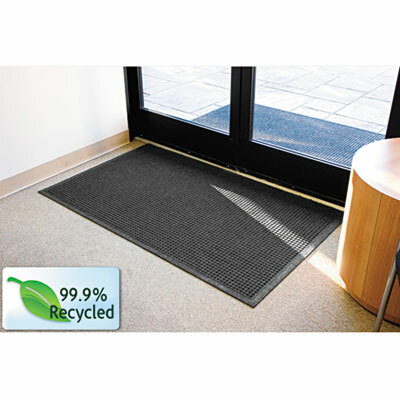 The durable crumb rubber backing is made from used tires, helping keep them out of landfills and waterways – and properly recycling a material that is notoriously difficult to decompose. The fibers on this mat provide better absorbency so, especially during winter months, you won’t be tracking as much moisture/dirt/salt/etc. into the office, keeping it cleaner for a longer period of time. The list below is just a sample of the benefits associated with LED Light bulbs and lighting systems. Everyone has heard of LED light bulbs and lighting systems, but some may not fully understand the advantages and disadvantages. The main disadvantage associated with LED lighting are the up-front costs. However, the multiple other benefits of implementing LED lighting systems far outweigh the up-front cost of bulbs, installation, etc. Following is a list of the 5 largest benefits of LED lighting systems. When comparing the efficiency of LED lights to more traditional lighting with conventional light bulbs, the difference is vast. 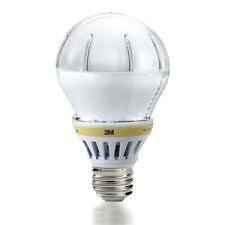 LED’s provide an estimated energy efficiency of between 80% and 90%. What does this mean? It means that 80% to 90% of the electrical energy you are paying for is converted to light, while the other 10% to 20% is converted to other forms of energy, such as heat. Traditional incandescent bulbs operate at 20% efficiency, losing the remaining 80% of energy to heat. These numbers are proof that LED lighting systems efficiency is far superior to traditional lighting methods. LED bulbs and diodes have a lifetime expectancy of up to 100,000 hours, meaning you could leave your lights on for 11 years – straight – without them burning out. Or, if you used them every other day, they would last for 22 years. Finally – if you use your LED lights for 8 hours a day, it would be 20 years before you would need to buy new LED bulbs. Needless to say once you invest in LED lighting technology, you won’t be buying light bulbs for a while. LED light bulbs are free of toxic chemicals – whereas most fluorescent light bulbs contain mercury and other environmentally hazardous materials. Contained in LED bulbs are non-toxic materials that are 100% recyclable and can decrease your carbon footprint by one third. Along with the reduced carbon footprint, 25 incandescent light bulbs equal 1 LED bulb, in terms of materials and manufacturing. So, with LED bulbs, you’re not only saving money and energy now, you are helping provide a greener future for generations to come. LED lights are extremely durable and are built with the ability to withstand strong environmental factors. Because of their ability to withstand these rough conditions, they are ideal for outdoor lighting systems – especially when exposed to wind or rain, construction sites or manufacturing sites, or vandalism. When powered-on, LED lights brighten immediately – eliminating the warm-up period seen in some traditional lighting systems. These benefits cater greatly to projects involving traffic and signal lights, but also work well for other projects. LED lights can be turned on and off without it effecting the lifetime or light emission of the bulb – whereas traditional lighting may take longer to reach full brightness and frequently turning on and off the light can drastically reduce the lifetime of traditional bulbs. These are just five of the main benefits to LED lighting systems. Honorable mentions also include reduced UV emissions, design and usage flexibility, light disbursement and much more. For an assessment on how your business can cut costs using LED bulbs, visit our website to contact our facility specialists today!